More than 40,000 boats rolled off the production lines of the O’Day Company insuring that O’Day will remain one of the most recognized boat manufacturing names in the world for years to come. Unfortunately, like Pearson, Ericson, Cal, Irwin, and other long time production sailboat manufacturers, O’Day could not recover from the industry downturn of the late 1980s and went out of business in 1991. O’Day built boats designed for the average sailor for 33 years. Designed by C. Raymond Hunt & Associates and introduced into the O’Day line in 1981, the O’Day 34/35 was one of the more successful cruising designs built by O’Day. The original design had an overall length of exactly 34’; however, in 1985, the transom was modified slightly and a boarding/swim platform was molded in. The change resulted in the addition of 11-1/2" to the LOA, and between 1985 and 1989, essentially the same boat was marketed as the O’Day 35. Both versions share the same waterline length of 28’ 9", the same beam of 11’ 3", and the same approximate displacement of 11,500 lbs. Both offered deep draft and shoal draft models drawing 5’ 7" and 4’ 3" respectively. Hull construction is a solid laminate of fiberglass and plastic resin, and seldom are there any significant problems found aside from occasional osmotic blistering of the bottom. Decks, like those aboard most boats built after 1970, are constructed with a balsa wood core to keep the structure light yet strong and rigid. This construction method has proven over the years to be strong and long lasting but it is critical that no moisture is allowed to contaminate the balsa wood core. I have inspected several 34 models that had poorly bedded deck fittings which had resulted in high moisture content of the core and considerable deck delamination along the cabin top inboard of the hand rails. There is an interior fiberglass hull liner that forms the lockers, seats and berths as well as a considerable part of the support of the hull shell. Access for inspection is minimal but, where it is possible to inspect, I have not found any serious failures. The keel is cast iron and most reflect a rather poor job of preparation and preserving the metal. Rusting scaling is common if an owner has not taken the time to prepare the surface and preserve it properly. One note of caution about the spade rudder is important. The same rudder was used on both the shoal and deep draft models of this boat and, on the shoal draft model, the rudder is nearly exactly the same depth as the bottom of the keel. This leaves the rudder quite vulnerable to damage by grounding even in the rather soft bottom of the Chesapeake Bay. Auxiliary power was provided by Universal Marine’s three cylinder, 21 Hp, fresh water-cooled diesel engine. This is sufficient power for the size and weight of the boat. The engine is installed beneath the bridge deck and, to the delight of mechanics and surveyors, the installation is not crowded. Access is good to all sides of the engine. The fuel tank and water heater are installed aft of the engine and there is a large port sided seat locker through which even a 200+ pounder can fit for easy access to and service of this equipment. Like most of O’Day’s cruising designs, the 34 is aimed at moderate sailing performance and spacious accommodations. By 1981 standards, the hull form is quite beamy; however, there are no extremes in shape to produce poor sailing performance or erratic behavior. The deep draft keel is a moderate aspect fin for good windward performance and the rudder is large for good control. Overhangs are short resulting in a reasonably long sailing length. The displacement/length ratio is 216, and the sail area/displacement ratio is 16.45. For comparison, the J/35, an extremely popular and successful racer/cruiser of about the same era, has a displacement/ length ratio of 165 and a sail area/displacement ratio of 21.8. While O’Day’s numbers certainly don’t reflect an all out racer/cruiser, none the less, the 34/35 is a decent performer and, when well equipped and sailed, is capable of bringing home some silver in club events. The interior arrangement of the 34/35 is right out of yacht design 101. There is a V-berth cabin forward followed by head to port and hanging lockers to starboard. There are port and starboard settees in the main saloon with a centerline drop-leaf table followed by a starboard side quarter berth and navigation station and port side U-shaped galley. This is a very spacious and uncluttered interior and what the arrangement lacks in imagination it more than makes up for in efficiency. This is exactly why this is such a popular layout with yacht designers and owners alike. 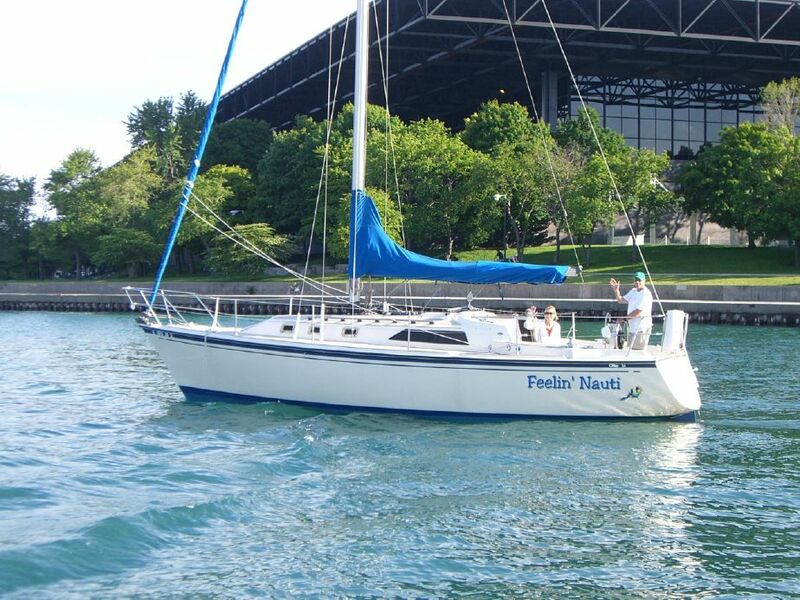 As it was originally intended to do, the O’Day 34/35 still offers contemporary styling, spacious accommodations and good sailing performance at a reasonable price.